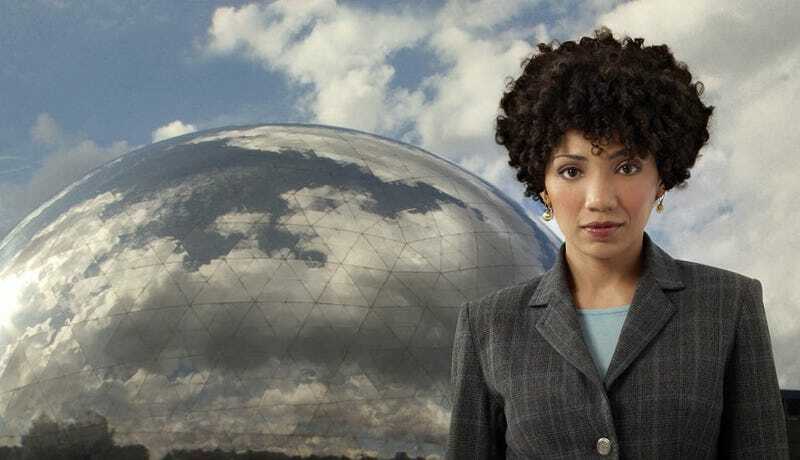 Jasika Nicole tells us what to expect from tonight's Astrid-centric Fringe! Astrid is one of the coolest characters on Fringe, but she's never gotten much time in the spotlight. Walter Bishop can't even get her name right, and we've only seen where she lives once or twice. So it's really exciting that tonight, we're finally getting an Astrid-centric episode of Fringe. I think that I had kind of become resigned in thinking that, you know, "Oh, Astrid is not going to get a big episode, and that's okay because it's been such a lovely thing to be part of the show." So anyway, I finally get the script and it is a heavy Astrid episode and not only just one Astrid but two Astrids. And then there's like all of this emotional turmoil that's going on within the story. So it was emotional on a lot of different levels. It was actually pretty overwhelming to play against myself. Not only because it was the first huge episode that I had just as an actor. But I was kind of doing double-duty as both Astrids. She's got these really emotional scenes. So what would normally take us maybe four or five hours to complete took us about eight or ten hours because we had to do it twice essentially. And there was actually one scene where there are both Astrids and both Olivias and then Walter and Peter. So, it just took us all day long. Anna Torv actually pulled me aside and gave me all these tips on how to do it because she's the one who, you know, plays her doppelganger in most of the show. So it was technically very difficult and emotionally difficult. But it was really, really exciting and totally worth it. Alt-Astrid is much more challenging to play just because she's so physically different than I am. I didn't even realize but after the first several months of playing her I would come home with a headache every single day. And it's because she's so stiff in her movements, and she's just got these mannerisms that I don't have and my body is not used to them. So it's really, really difficult to play her. Also, because she speaks so quickly that I have to know my lines like, backwards and forwards because she spits it out really, really, like spitfire quick. So she's the most fun and the most challenging actually. The main reason that she comes here is to, I think, get a little bit of clarity. She knows that this Astrid is different than she is. I'm not sure exactly how she knows, you know, maybe she's heard other people talking or something, and that is a really key element in figuring out what her next steps are. So she wants to see this other Astrid who's different than her, who is emotionally available and who probably has different relationships with the people in her life, and that's why she comes here. I think that the biggest challenge that I went through was this season, actually, when we started this new timeline. Then, I realized that all of the relationships were different now that Peter had never been a part of our lives and we didn't know who he was. But, specifically, the relationship between Astrid and Walter was really different because Olivia was more his confidant, his caretaker. He would seek her out when he was in a bad place and needing help and he didn't really go to Astrid so much. She was more his babysitter than his friend. That was really difficult for me at first because I wasn't sure why Astrid was a part of the team if it wasn't to be Walter's guide and, you know, his shoulder to cry on sort of thing. But then as the season went on I realized that because she didn't have such a close relationship with Walter I think that she was the only person in this world that was welcoming to Peter. You know, Olivia didn't want to have anything to do with him. Walter didn't want to have anything to do with him. Broyles was totally freaked out by him and Astrid was the one who was always saying, "You know it's okay. He's probably not a bad guy. We've got to help this person." So that was kind of, you know, an interesting different choice to have made. I just wasn't expecting it. But now that, you know, we've had this huge Astrid episode I see that her relevance is way even beyond just helping Walter because you can see that she helps everybody. Alternate Astrid is closed off. She's got Asperger's. So she has some fundamentally different things about her that make her associate with other people and the rest of the world. I don't think that she necessarily wants to be closed off or wants to be awkward in conversations and social interactions. It's just how she is. But I think that knowing that there is another version of her out there that doesn't have these difficulties makes her excited, makes her want to meet her and know what her life is like. And because of this traumatic event that ends up happening to one of alternate Astrid's, family members that's the impetus to bring her to this universe to find out more about, you know, the could have, should have, would have's. I think that this Astrid needs the alternate Astrid just to give her perspective on her life. You know, she's been closed up inside this lab for the last four years with this, kind of, crazy doctor and these really bizarre, terrifying things are happening in the world. Then she meets this woman that looks just like her that could've had the exact same life as her and did not. So that, I think, opens up her eyes a little bit to let her realize how fortunate she is to have these people in her life. As crazy and dysfunctional as her work family is, it is a family and that is of great significance to her. She's got this really lovely kind of like BFF relationship with Olivia [in the new timeline] that we never got to see before. And I absolutely love that. I think that the fans have really been into that too because this whole time we've had–these are the two women that work together the closest because, of course, Nina is a part of the show. But she works at Massive Dynamics and is a bit separate. So when we would have all these scenes [in previous seasons], and you would never see Olivia and Astrid like hanging out and talking together. It was like, "Oh, why wouldn't they be friends? You know, they're both really smart. They have a very similar difficult job. They work with the same crazy people." So that was a really, really cool part of this season is seeing Olivia and Astrid hang out together. And now I have this idea that they probably like, you know, go out for wine twice a month or go to see a movie or something like that because they're with each other so much of the day that they have to depend and rely on each other more so than what we see in the actual episodes. Each little scene is so precious that we get. So I, like, at one point knew exactly how many scenes Olivia and Astrid had together where you could tell that they were friends. We do have a couple more coming up which is really awesome, and maybe even more for the rest of the season. So we'll see. You know, I thought about it a lot actually and I think, ironically, that one of the reasons people like her so much is because they don't know that much about her. I think that apart from the observer she's kind of the most mysterious person that's involved in the show. And to have this really young invested FBI agent who shows up to work every day with a smile on her face that tries to keep the energy up and is generally always in a good mood. I'm really fascinated by who that person is because you know you see Olivia, who is also a young, really talented, intelligent woman in the FBI, and you know that she's going through a lot of stuff. She's dealing with all kinds of personal stuff and work stuff and figuring out where her boundaries are and where personal life doesn't cross over into work life. You don't get to see Astrid going through those things. So you wonder how is she handling this when she goes home. So I think maybe that's one of the reasons that people love her so much because they've, kind of, had to create a whole story for her since there hasn't been given to her.